Rejoin broken old frames including rebuilding missing compo sections and new leafing if required. Changing the color on a frame you might want to re-use with a new piece of art. Hand carving frames in a custom design to match your artwork. 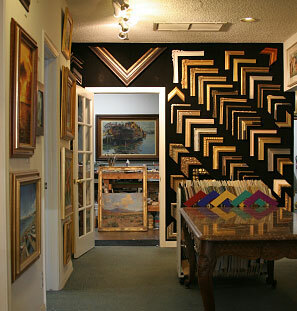 Wide selection of closed corner custom made frames. Can handle frames as large as 10 feet across. Can customize ordinary moldings with special color or texture. CLICK HERE FOR FREQUENTLY ASKED QUESTIONS ABOUT FRAMING.